Home>Articles>Does «winter» and «summer» gas exist? Liquefied petroleum gases or LPG (GPL – Gaz Petroleum Liquide; LPG – Liquefied petroleum gas) are the mixtures of propane and butane, which found wide application in industrial field. Propane-butane mixture is used in cisterns for LPG storage and, when it mixed with air, provides complete, uniform combustion. Evaporating of propane happens at -42 °С. Less expensive butane evaporates at -0.5 °С. That’s exactly evaporating temperature which determines different mixture composition. It divides it for «summer» and «winter». 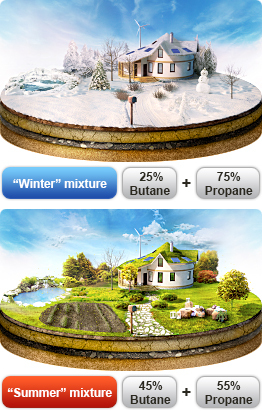 If you use «summer» mixture during hard winter, efficiency of gas tank will be reduced – gas will be slightly evaporating, pressure will fall, boiler will stop. To avoid it it’s reasonable to welcome frosts together with «winter» gas, completely used «summer» gas before soil freezing. Then «winter» mixture and «Antonio Merloni» vertical gas tanks will do their work using geothermal earth energy, keeping working capacity when it’s -40°С outside of private house. 2. How to calculate the quantity of cubic meters of gas evaporated from 1 liter of liquefied gas? Does the formula change when you use «winter» or «summer» mixture?